Having drunk the entire bottle of Floradix, that should have lasted a minimum of 25 days, in 16, plus taking additional iron tablets I hoped I might be a bit better this week. (Obviously overdosing on iron isn’t sensible and won’t actually work but I can’t be trusted with bottles of stuff, I just need to finish them as quickly as possible.) I set off for track hopeful that I would be able to stick with Rick’s group. The session was (3 x) 600t, 300f, (60s rest) 600t, 200f, (60s) 600t, 100f (2 mins recovery). Thankfully I was able to stick with Rick’s group so was pleased after two weeks of weakness. 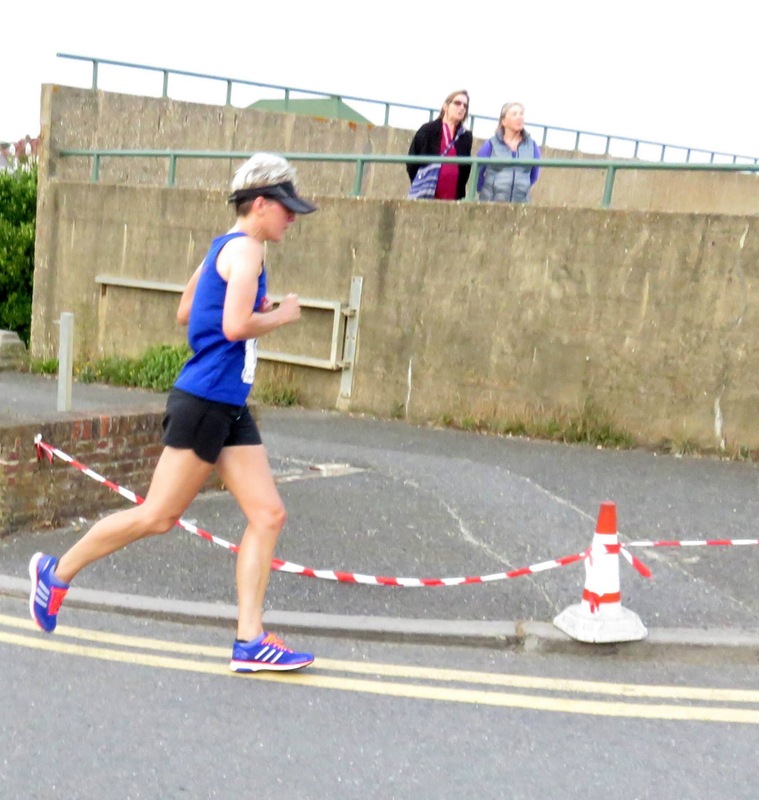 On Tuesday I had the unenviable task of having to do a LSR on my own. I set off with the intent of doing my usual 10 mile route. As I was setting off along Kingsway I got honked by Trevor in his car. I waved, smiled and continued on my way. On the way back towards the King Alfred I bumped into Trevor heading the way I’d just been so thought I’d gatecrash his run for a bit to force me go a bit further. It did. Faster too. Soon I discovered myself travelling at a none too leisurely 8mm chatting all the while and in no time we were traversing the arm at the marina. This was all very well but meant my run would now be a minimum of 14 miles, 5 miles back into the wind, with around 4 miles at 8mm (and under) pace already under my belt. Yikes! Unsurprisingly I totally conked out with a few miles to go but finished still sub 9mm with Trevor’s encouragement. I think this shows the iron has begun to take effect as I wouldn’t have been able to do anywhere near that last week. I would have liked to have gone to Tom’s session on Thursday but as I was at work all day it would have been tight and I would probably have found it harder so I decided to have a go on my own on Wednesday morning instead. His session was up to 10 x 500m. Having done somewhat more on Tuesday than I had expected I only managed six. They ranged from 1.55 – 2.03 depending on wind being with or against. This was acceptable. 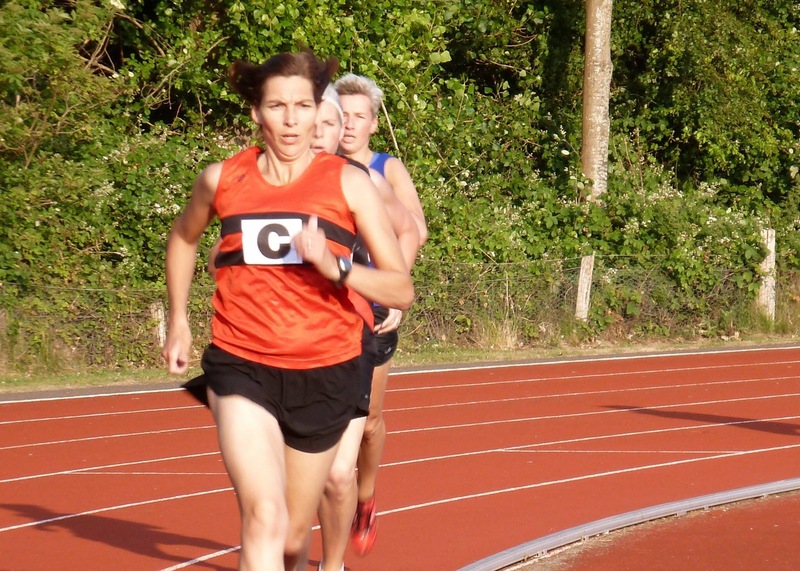 In the evening it was back to Run Club where Jo had sprints on the agenda. 7 x 100% effort sprints of approx 60m. Happy days! Though I learnt that not doing your shoelaces up properly is not good when sprinting. I did nothing on Thursday and Friday. 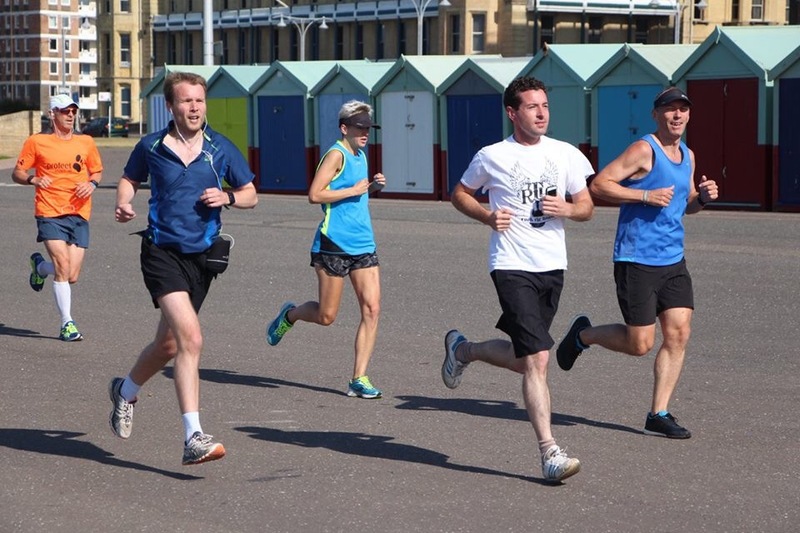 Saturday was another trip to Hove Prom parkrun. I had a plan as I knew it was going to be windy. Try and speed up on the wind free stretches. This went well on the first one but then the long stretch into the wind gave me a stitch which I failed to clear so I was unsuccessful on the second one. Then my continued lack of speed endurance joined me which made for a snailesque final few kilometres. I did do a few unexpectedly good runs this week so I suppose it’s inevitable one at least wouldn’t be that good and looks like this was it. Over all though I was pleased with the improvement in strength so let’s hope it continues and I can start getting back on the road to 2013. 30 miles for the week. About a month ago I put in my earplugs for bed as usual then wondered why there were so many fireworks going off outside before (after a long time) realising it was my heartbeat pounding in my head. Even though I go to bed at about 9pm and get up at 8am I still need an afternoon nap. General depression (which I have suffered from truly but sometimes maybe it was more lack of iron than “true” depression). Track on Monday was a drag at slow speeds (oxymoron – I am). It was supposed to be 4 x 1000 then 4 x 500 slower but there isn’t much slower than slow which is what I was all the way through. Phoenix was utter heck. I managed 3k at 42 minute pace then that was it and I hauled my sorry feeble form home in one of the greatest positive splits known to man. I think this is possibly my second worst run ever (after Bluebell 10k last year). 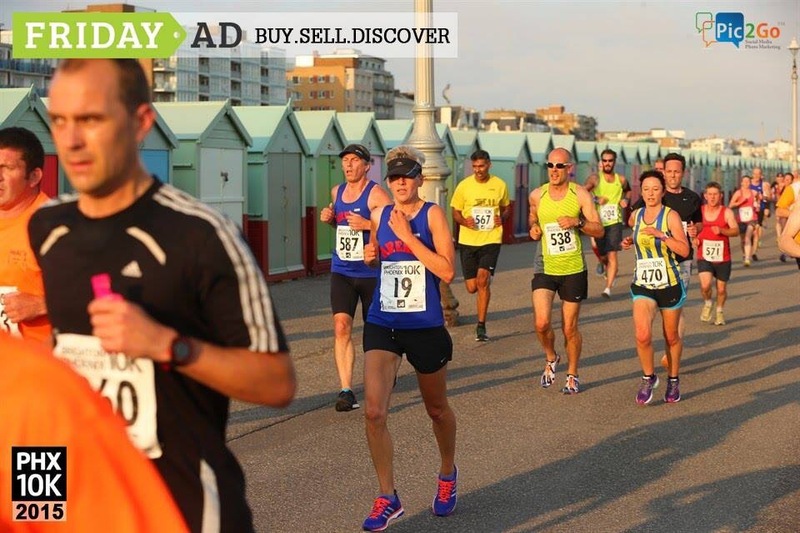 However as one can only rise from the very bottom I set off for Hove Promenade parkrun hoping that perhaps the only way was up (thanks Yazz for the misquote). After setting off too fast for my current state last week with Rick this time I went out more sedately with Rob (who has been the King of Sensible recently). At around halfway I felt ok so thought I’d see if I could pick it up a bit. I could. A bit. This was promising. I even had my eyes shut which is always a sign of whether I’m trying or not. I had to remind myself it’s about being able to put in effort that counts at the moment and not to be too worried about my time. 21.11 so 10 seconds faster than last week and run in a much more sensible/consistent way. Now I want to go sub 20 at this parkrun to complete the trio but must continue to be sensible and realise it could take a while to get fully ironed up and back to that sort of form. I haven’t forgotten my quest for 18.59 for 5k but obviously this will have to be rather far in the future as I still have minutes to go before I’m even back sub 20. After this run though I’m feeling a little more positive after Wednesday when I was so not happy I wasn’t quite sure what to do with myself. Only around 19 miles for the week but hopefully I’ve turned a corner so I can get back to it properly. I went to track on Monday, failed to be able to keep with my group for even 200m of the rest 1k rep and suddenly it struck me. I’m anaemic again. I think waking up with serious cramp in my calf on Sunday was the first step to realising. All the signs were there yet as usual I blamed them all on myself. What a div. I stopped my iron tablets a while ago as they were causing some unpleasantness and I thought well I’m not anaemic any more. What an utter fool! Anyway at least this time I’ve worked it out when I’ve only regressed back to a 44 minute 10k rather that 52 minutes like the first time. I’m trying Floradix this time to see whether it has any side effects. So far so good but I’m only on day 6. I’m so pleased I can put a diagnosis on it as I know in a few weeks of being back on the iron I can start feeling back to full strength physically which means I don’t have to waste any effort on that so can direct it all on to conquering the ever present mental barriers. As Monday was the worst I’ve felt for a long time (I must have reached the tipping point of when low iron becomes anaemia) I was glad for the rest on Tuesday. 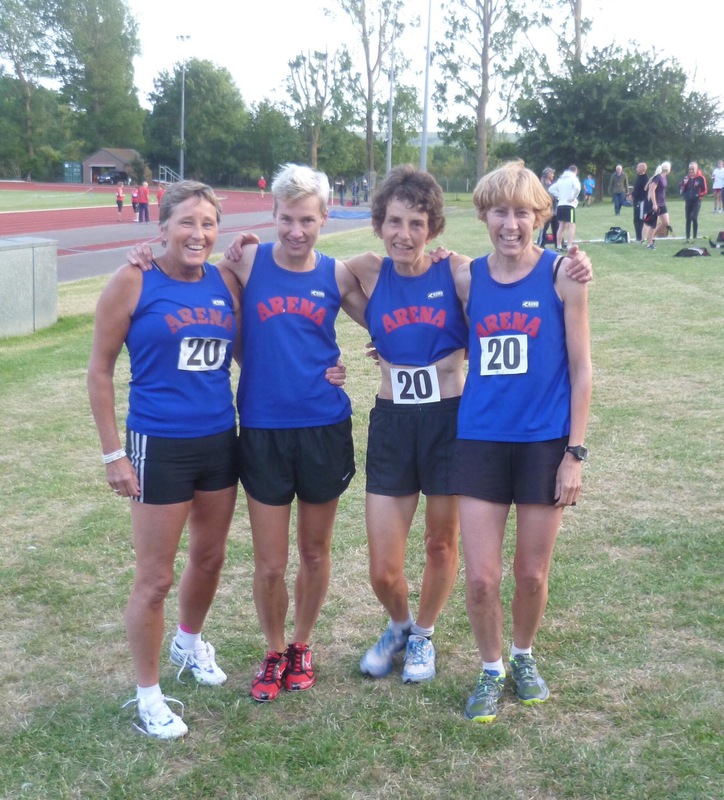 On Wednesday evening it was another vet’s league jaunt. This time at Lewes. the first race was the 800. I hadn’t even thought about this race and suddenly realised I was about to run my first 800 for ages when we were on the start line. Off we set and I still had no idea what I was doing. I found myself in about fourth place trundling along quite comfortably approximately 5 metres behind Jeanette who was leading. As we came up to 600 I was still there which surprised me but then I thought well this has panned out nicely for an old fashioned Muir sprint finish so I began to close the gap with Jeanette as we neared the home straight. 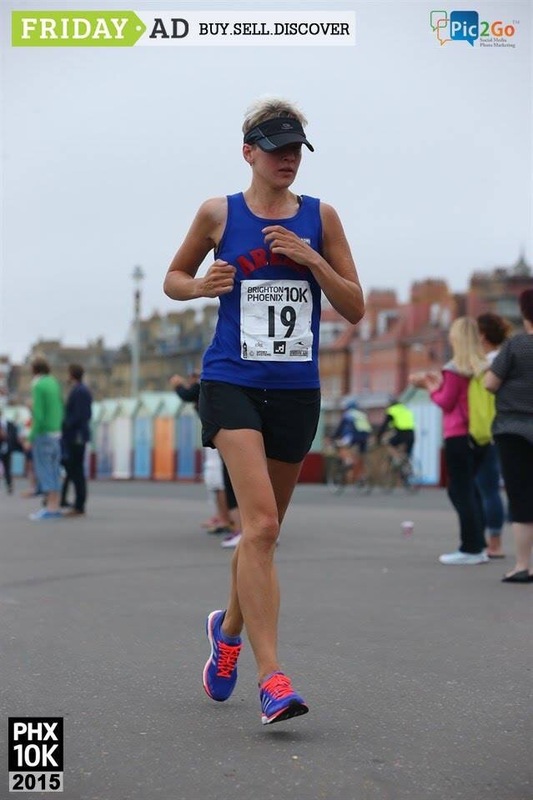 I caught her with around 90 metres to go and put the pedal to the metal into the strong (but not Worthing strong) headwind which resulted in much flailing and windmilling in the traditional style. I was surprised to discover later that I ran 2m 47 as it felt slower (though that isn’t at all fast). The trouble with the 800 being first is that no matter how you run it it kills you off for anything afterwards. As I had used up 100 metres of my sprint in the 800 I found myself setting off slowly then dying in the home straight in the 200. A hideously slow 32.5. I shall add that to the PW list. Next up it was the long jump. I don’t know what was going on but we were all awful! Really really crap. I blame sexist sand and a lying tape measure (though it was being wielded by the honest and marvellous Graham and Paul). Utterly poop jumps of 3.46, 3.79 and 3.40 still gained me first place as Catriona who usually jumps further than this was also suffering the curse of the Lewes long jump. The relay of the day was 4 x 200 and for the second time I had a full scoring relay team! Yippee! Caroline led us off in tremendous style having just finished the 5000 and handed over to Jenny who stormed her leg passing over to Lesley who caught up the girl in second place. After handing over to me I dodged past her and tried to chase down the Brighton team who had quite a lead. I closed them up a tiny bit but we finished in second place. I ran possibly the most ragged last 50 metres ever. Dang that 800! As always I really enjoyed the evening even though it contained some spectacular personal worsts. On Thursday I enlisted the company of my LSR partner and off we set for a nice easy run (I realised, in retrospect, that my total inability to do long runs at any pace under 9mm also pointed to anaemia). Rob had looked up a new route for us to try but I was so busy blathering that we had gone past where he meant for us to turn off and then his secondary route was blocked by dawdling pedestrians so we ended up just coming back the normal way. We added a loop of Hove Park so Rob could test out his ankle/heel as he’s been being very sensible and keeping it flat knowing hills made it worse. He powered up the hills for a successful test and had to wait for me as I was seriously lagging behind. This run was a nice, manageable, slow 10 miles. In the evening Tom had planned a session of (2x) 6 x 400m. I knew I’d only do one set as I was being sensible after vet’s league. The plan was to run the reps at just below 5k pace. I was pleased with 84, 87, 84, 84, 82, 81 which is somewhere around 3.40 per k pace. 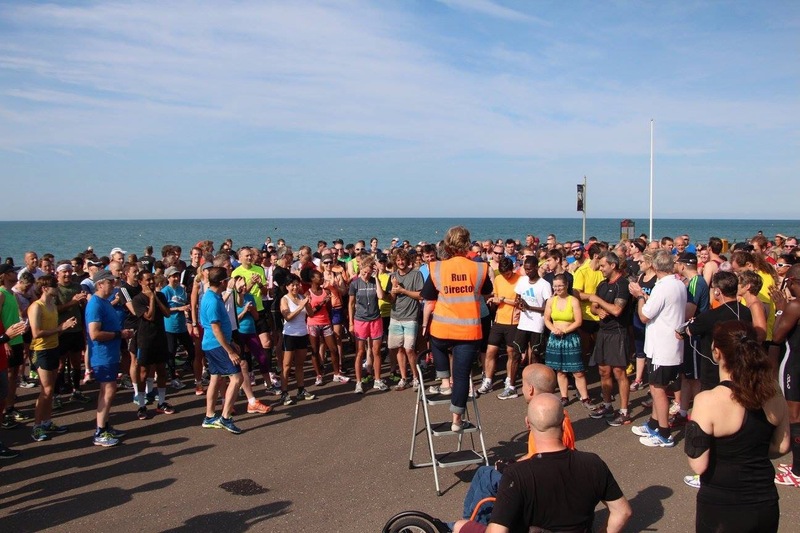 Saturday was the first Hove Prom parkrun so I cycled along as I’d promised Mark I’d help set up and then run/scan. 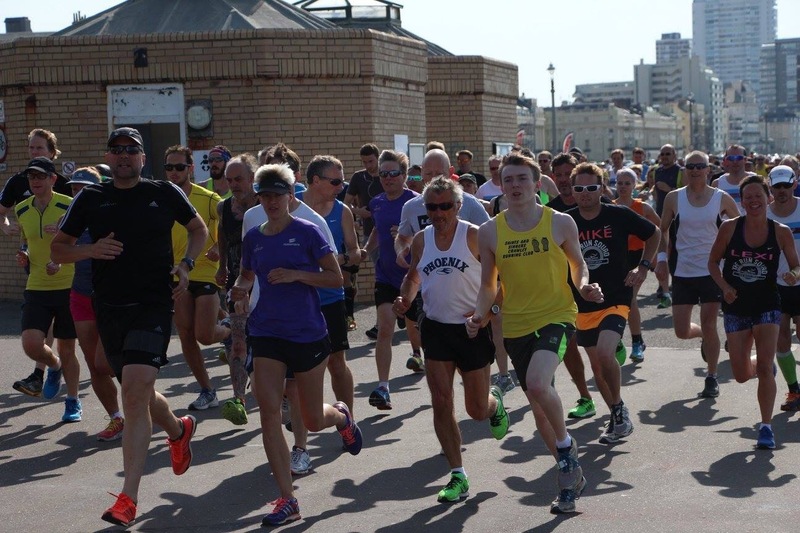 A healthy turn out for the inaugural Hove Prom parkrun. Thanks Mark Brocklehurst for the photos. Hot hot hot! The weather not Rick and I. Though Rick is of course. Don’t know what Rob’s looking at. I needed to run vaguely fast so I could leap straight into scanning duties after I finished but I totally died of heat (odd as usually I love it) around halfway and slowed down a lot. Anyway I finally crossed the line after what seemed like days and donned the high vis and scanned scanned scanned. It was good to try a new parkrun, especially one so close to home. Congratulations to Mark for setting up this parkrun. It seemed to go without a hitch and he’d even arranged a nice, sunny and only normally windy day to start it off on. This course could be good for a pb, flat and fast, though as it’s usually really windy in one or other (or both) direction(s). 21.21 my result text told me. Something to aim for the next time I go there. Only 24 miles this week. Due to an attack of bad stuff in the brain I did 8 very slow miles on Monday morning in an attempt to run myself back to sanity. It did not work. Track. Steve was in charge. Kilometre reps x 6. Split into 500t, 300 @ 10k pace and 200 @ 5k with 90s recovery. Pete dragged me back up to his group which I had fallen out of some time around May for reasons I don’t even recall. I managed to keep up for the first 4 x 500, dropping off as the others sped up. This was no doubt due to the fact the “tempo 500” was probably my current 5k pace. I persevered but only did the 500t of the last two reps as by then I had dropped off the group even before the end of that first 500. This could be termed laziness, and may well have been – by me – , in the past but now I realised it might be good to not keep flogging a dead horse and bow out gracefully rather than tiring myself out further for no gain. I told Pete he must drag me into his group each week as it definitely makes me work harder and improve which is, after all, the point of training. Quality not quantity. Wednesday was quite hot and as Rob was ill I did not do a LSR in the morning. I decided instead to run to Run Club in the evening as that would give me around 10 miles by the time I got home. Which it did. On Thursday I wanted to try Tom’s session without having done a run in the morning. So I duly trotted over in the evening. I knew the session was mile reps. Between three and five. I wanted to do them as close to six minutes as I could. After a few drills it was time to run. I set off purposefully and probably a little too fast (surprise). I finished in 6.19 with Cathy right behind me. I know she gets progressively faster as the session continues so I knew I would need to try and keep up with her. I did not. She got a few seconds faster on each rep as I got slower. After a 6.23 and a 6.27 I decided to stop having done the minimum number of reps and once again thinking it would be beneficial to do the last two as they would only have been ever slower, tiring me out for no gain and making me further annoyed with myself. Cathy quite rightly pointed out we should be much nearer to 6 minutes anyway. Well the test of not running in the morning seems to show I am worse so perhaps I’ll run in the morning again next time. In a bold and frankly shocking move I asked Rob if he would like to run with me on Friday (Friday! I ask you [well I asked him actually]). He agreed and requested we draw as spaghetti-y a GPS route as we could so as soon as we met we went of piste taking in the side streets of Hove, Portslade and Fishersgate. We crammed 10 miles into a reasonably small area and discovered some places we didn’t know existed. We were going to go to Hove Park parkrun for a change of scene but do to some hungry cats and the wrong key we ended up at Preston Park. I was feeling strange (in a different way to the usuals) and didn’t fancy actually running. Luckily (well not for him of course) Rob had strained his back so was happy to trot around with me. We started quite far back and just progressively sped up throughout. We did get lapped by the first two runners just as we were discussing never having been lapped there before. I was surprised by our 24.26 clocking as I thought it was slower. As there was no effort involved (except a few metres up the last hill) it was a thoroughly enjoyable run. A nice gentle test of my new shoes. I’m the one in pink socks! 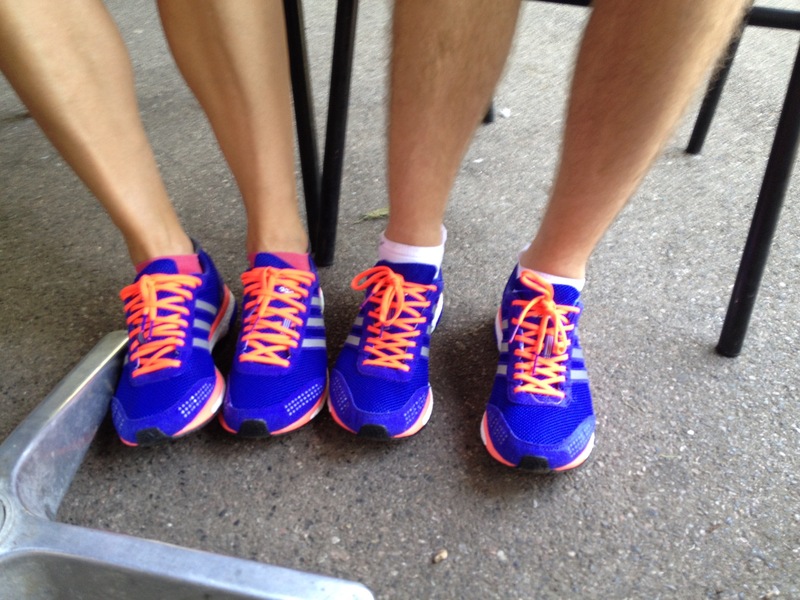 I copied Joe on the shoes though as he is a man of great taste (and I have giant man-size feet). Sunday meant a race I haven’t done before. 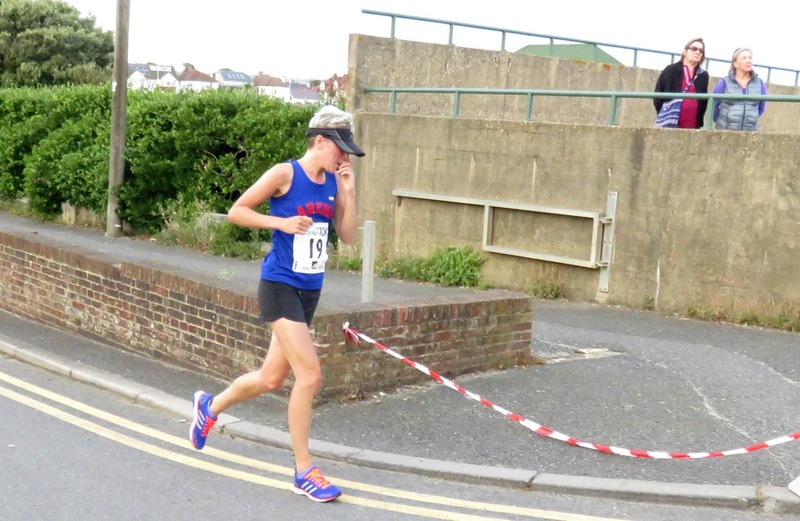 The Seaford 10k. Mark very kindly came to pick me up as he was doing the half marathon option. The weather was very wet and rather cold. Currently I am totally not in the mood for races and I just wanted to run incognito to get a 10k tempo in the bag if nothing else. 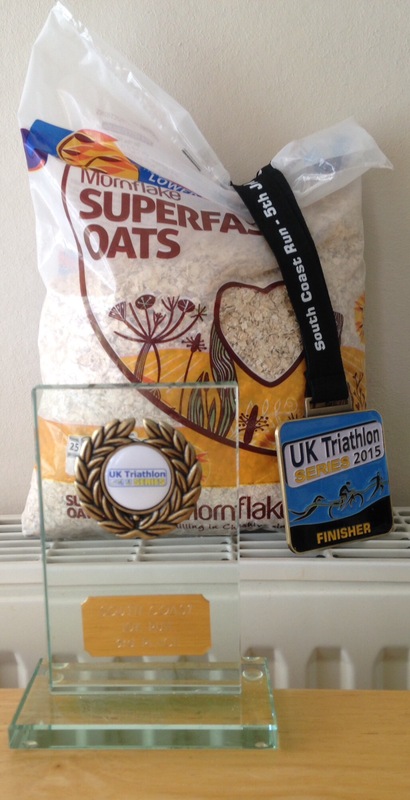 I won a full size bag of porridge! Third lady but that’s irrelevant. Porridge! 46ish miles for the week.